Tomorrow is January 6th, so that means that even the longest holiday celebrations are officially coming to an end. I started the holidays in Barcelona, and finished off home in California. So here are some of my photo highlights. Next, I caught the Christmas special show at the Font Màgic – the Magic Fountain. It was a changing light show set to the tune of everything from traditional Catalan holiday tunes to “All I Want for Christmas Is You” by Mariah Carey. On my last night, I stopped by the Sagrada Familia to see the special Nativity scene light show. They lit up the scene carved into the side of the church with moving lights. I also snapped a couple of photos of fun holiday decorations around my office, as well as the traditional caganer – the pooing man. In Catalunya, it’s an honor to have a figurine of yourself poking, so only people like the royals and the fútbol stars get their own caganers. 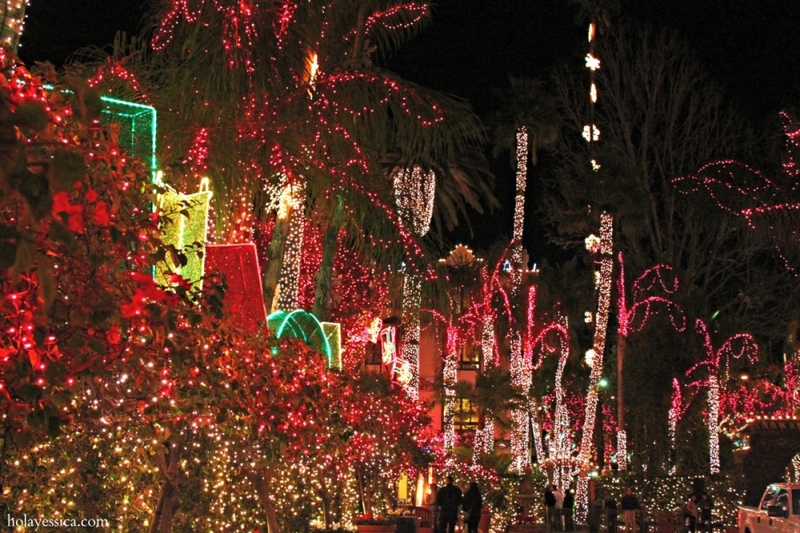 And then when I got home, I went to see my city’s big tourist attraction – the Mission Inn Festival of Lights. The Mission Inn is a fancy hotel done in the style of the California missions. It’s actually one of the top historic hotels in the United States. During the holidays, it gets lit up with 3.6 million lights. Hope you enjoyed the photos as well as your holiday celebrations, wherever you are! P.S. If you haven’t noticed yet, I updated my URL to just holayessica.com (no more WordPress). New year, new(ish) name. wow!! those are some spectacular lights! Yep, I got to see some pretty amazing lights displays this holiday season! Looks like you figured out how to do mulitiple slideshows in one post! woo woo. I just got back from traveling so didn’t have a chance to explain. I’m not actually self-hosting (yet…though I keep thinking about it). I just bought my domain name from WordPress – you can just go to the ‘store’ option in the dashboard and get it. It’s really easy and looks better. Self-hosting is the next step, once I work up the courage! The “magic fountains” and that back facade of La Sagrada Familia were always some of my favorite things to see in Barcelona when I studied there 🙂 Not quite my favorite thing — the caganers! Mine too! The caganers are definitely a different story. Wow, I had no idea Barcelona went so overboard with the lights. I absolutely love it! It looks like the Sagrada Familia was especially cool. Lucky you getting to witness Christmas festivities in Barcelona! They definitely had lots of lights up! It was a lot of fun to see their Christmas celebrations – some of them were so different. Congrats on getting the domain!! Haha, the caganeros(?) always make me laugh. Yess, the caganers are hilarious. So weird! Amazing photos – the lights in Barcelona are really something! Makes me want to go there around Christmas time now! Seeing the Sagrada Famiglia lit up like that must have been quite an experience! It was great! If you have the chance to go around the holidays, it’s really lovely. Celebrations start early December and go until January 6th, so there’s plenty of time to visit.